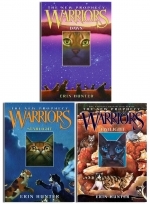 Warriors cats collection, by Erin Hunter buy from snazal wholesale books at lowest price. 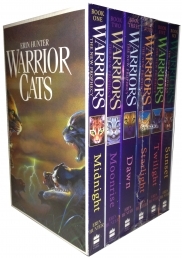 Warriors cats very unique and classic collections for children that tells you the greatest story of all time. The second of six titles in this thrilling feline fantasy adventure. Darkness, air, water, and sky will come together and shake the forest to its roots Several moons have passed since six cats set out from the forest on an urgent journey to save all their Clans. 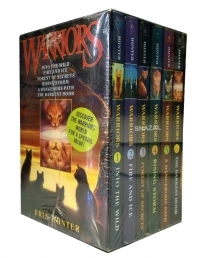 Now those six are travelling home again, but on their way through the mountains, they meet a tribe of wild cats who seem to have their own set of warrior ancestors . . . and their own mysterious prophecy to fulfil. Stormfur can't understand their strange fascination with him, but he knows the danger they face is real. Meanwhile, back in the forest, Firestar's daughter Leafpaw watches ThunderClan's world crumble around her, as the humans' terrible machines destroy more and more of their home. Will the questing cats make it back in time to save the Clans, or will they be too late? The fourth of six titles in this thrilling feline fantasy adventure. Before there is peace, blood will spill blood, and the lake will run red The gripping adventure that began with a small house cat in Into the Wild continues with Book Four of the thrilling Warriors spin-off series The New Prophecy. These cats' devoted fans have catapulted them onto national best-seller lists, and the support for the series grows stronger with every book. Now the warrior Clans have finally reached their new home, but their troubles are far from over. Don't miss the next adventure of Brambleclaw, Firestar, and ThunderClan in Starlight, featuring new maps of the Clans' unfamiliar territory at the front. The penultimate title in this thrilling feline fantasy adventure. Before there is peace, blood will spill blood New territory brings new troubles for the fierce cats of the warrior Clans, who are still uncovering the secrets of their new home around the lake. Dangers they have never faced before are lurking in the twilight shadows, and former allies are acting strangely hostile. As divisions between the Clans grow deeper, Firestar's daughters face troubling decisions. One is torn between loyalty to her calling and a forbidden love, while the other struggles with her best friend's betrayal and the surprising perils of the forest. 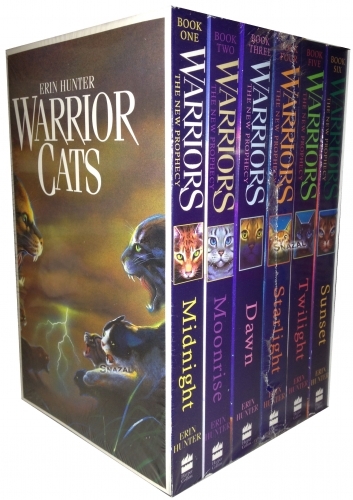 The choices they make now could affect ThunderClan for generations to come . . . and with an unexpected enemy preparing to attack, their courage and strength will be needed more than ever if the Clan is to survive. The final title in this thrilling feline fantasy adventure. Soon after the cats reached their new home by the lake, ThunderClan's medicine cat Leafpool received an ominous warning from StarClan: Before there is peace, blood will spill blood, and the lake will run red. 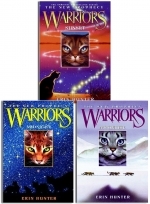 As the Clan slowly recovers from a devastating badger attack, Leafpool can't help but wonder do her prophetic dreams mean there are even worse dangers still in store for the warrior cats? At the same time, shadows of the past continue to haunt the forest as some old friends struggle to find their place, others appear to be lost forever, and an old enemy finds a new way to resurface in a quest for dark revenge. A sinister path is unfolding, and the time is coming for certain warriors to make the choices that will determine their destiny . . . and the destiny of all the Clans.